When it comes to retirement, we spend most of our time thinking about accumulating funds. We spend very little time at all thinking about how we are going to distribute all our retirement funds in a fashion where we won’t outlive our retirement savings. With so many different options for retirement income; one question you may ask yourself is, Should I consider buying an immediate annuity for retirement? Guaranteed Paycheck – Get a guaranteed income stream that you cannot outlive. 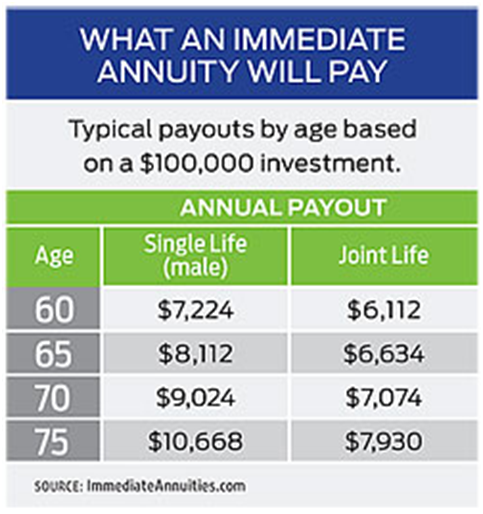 Many people buy an immediate annuity to turn a lump sum of cash into consistent steady paychecks. These guaranteed paychecks can be used to cover some of your fixed retirement expenses. These paychecks will last your entire life no matter how long you live. You can even set it up where the checks continue to go to your spouse when you pass away. Certainty – Your income is not impacted by market swings. You can be certain that your income will remain stable and that it will be there each and every month. Also, like social security, the longer you wait to start receiving your paycheck the more your paycheck will be. Protection – Annuities are products sold by insurance companies. Therefore your payments are protected against default form the issuing insurance company. Make sure to check out the financial health of the insurance company you are considering purchasing from. Also, each state provides a guaranty fund to protect annuity owners in case your insurance company faces financial trouble. Longevity Insurance – This corresponds with Reason 1. You cannot outlive your guaranteed paycheck. If you live to 120 years old, then you continue to get your paycheck. Work with a qualified financial advisor to determine if an immediate annuity should be part of your retirement income strategy. Be careful because most insurance salesman sell annuities. They are not right in all situations. Be sure to check the credentials of your financial advisor to make sure they are qualified to give advice on effective retirement income strategies.